Travelers are voting Keangnam Hanoi Landmark Tower as the best skyscraper in Hanoi. You can find 1 skyscraper in Red River Delta and 6 skyscrapers in the country of Vietnam. 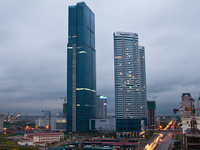 Keangnam Hanoi Landmark Tower is the top pick in Vietnam. Want more? Check out our map of skyscrapers in Hanoi.